Foreigners do not own more than one percent of property in Malaysia, revealed Housing and Local Government Minister Zuraida Kamaruddin. The government is currently studying the Airport Real Estate Investment Trust (REIT) mechanism including suitable airports to reduce ownership up to 30 per cent. MATRADE has continued to create greater awareness and visibility on Malaysia’s capabilities and expertise in providing world class oil and gas products and services through participation in Adipec 2018. Aviation experts have mixed reactions over the government’s proposal to introduce a departure levy for all outbound air travellers starting June 1, 2019. Earnings growth in the rubber gloves sector are expected to slow down but remain resilient as the demand-supply dynamics in the industry normalises. Malaysian Resources Corporation Bhd’s (MRCB) unit has inked a termination and settlement agreement with the government over the concession for the Eastern Dispersal Link Expressway (EDL) in Johor. Family members of three murder victims urged the government Friday not to abolish the death penalty, a day after a Malaysian delegation faced the United Nations Universal Periodic Review in Geneva and agreed to abide by a moratorium on executions. The government is expected to gain a few hundreds millions ringgit annually from departure levy collection for all outbound travellers, said Transport Minister Loke Siew Fook. Prime Minister Lee Hsien Loong and Malaysian Prime Minister Mahathir Mohamad on Monday (Nov 12) reaffirmed the strong relationship between Singapore and Malaysia, during an official lunch hosted in honour of Dr Mahathir and his wife Dr Siti Hasmah Mohd Ali at the Istana. Petronas has emphasised that all its dividend payments, including the one-off special dividend and any future dividends, will take into account its ability to service debts. Malaysia’s Human Resources Minister M Kulasegaran has announced the discontinuation of the 30% deduction of registered employers’ Human Resources Development Fund (HRDF) levy contribution into a Consolidated Fund, effective 15 November 2018.
pent-up demand during the consumption tax-free period was a silver lining for economic growth. PIKOM will be hosting the 2018 PIKOM Leadership Summit (PLS 2018) premier C-level thought leadership event and Taiwan’s System Integration Promotion Alliance (SIPA) under Industrial Development Bureau (IDB) will bring a delegation of clean-tech and security companies. DPI Holdings Bhd has executed an underwriting agreement with Affin Hwang Investment Bank Bhd for its proposed initial public offering (IPO) on the ACE Market of Bursa Malaysia slated for January 2019. The Malaysian Palm Oil Board (MPOB) said today that the nation’s total palm oil stock increased 7.63% to 2.72 million tonnes in October 2018, from 2.53 million tonnes in the preceding month, as crude palm oil (CPO) production rose. The proposals in Malaysia’s 2019 Budget are likely to have only a limited impact to Fitch Ratings’ rated Malaysian issuers, Petroliam Nasional Bhd (Petronas) (A-/ Stable), Genting Bhd(A-/Stable), and Sime Darby Plantation Bhd (BBB+/Stable). Malaysia is seeking a full refund of all the fees it paid to Goldman Sachs for arranging billions of dollars of deals for troubled state fund 1MDB, said Finance Minister Lim Guan Eng. TRADING of shares in Panasonic Manufacturing Malaysia Bhd (fundamental: 2.20/3, valuation 1.10/3) triggered our momentum algorithm last Friday for the first time this year. Malaysia and Singapore shares slipped Monday as plantation and financial services stocks declined, while worries over rising U.S. interest rates and trade tensions weighed on broader sentiment. Caught in the middle of the ongoing US-China trade war, Finance Minister Lim Guan Eng today said that Malaysia does not intend to take sides but to position itself as a safe haven for investors. THE entry of Singapore-based private investment platform Fundnel into Malaysia will provide small businesses with more options to raise capital for growth. Businessmen representing Chinese, Indian and Mamak restaurants nationwide today came together to voice their unhappiness with Putrajaya’s decision to enforce a blanket ban on smoking in their outlets next year. Fraser & Neave Holdings Bhd (F&N) expects 90% of its product line to be subjected to Malaysia’s proposed sugar tax on sweetened beverages. But the impact of the tax on F&N’s business cannot be ascertained at this juncture, as the company awaits more details on the tax. A Kolkata-based NGO had first brought attention to the plight of job seekers who had gone to Malaysia. 62 Indians, including 32 from West Bengal, were “sold” by Indian agents to two Malaysian organisations as “slaves”. Whose freedom of speech, Mahathir? Does the prime minister really think it is his administration’s prerogative to grant or deny the freedoms that are associated with democratic life? A news report on Nov 8 quoted him as warning the public against causing trouble in “matters concerning race and religion” through the “abuse” of the freedom of expression “given by the government”. A death sentence given to a young man selling cannabis oil to the ill has stirred debate in Muslim-majority Malaysia about its ultra-tough drug laws. The case has prompted calls for the country to become the first in Asia to legalise medical marijuana – but long-held stigma and a mostly conservative population means change could come slowly. StashAway, a robo-advisor headquartered in Singapore, has made available its services in Malaysia. Malayan Banking Bhd’s (Maybank) insurance, takaful and loans segments are expected to continue to drive the bank’s growth, going forward, analysts say. The demand for tickets to the match between Vietnam and Malaysia in the ongoing ASEAN Football Federation (AFF) Suzuki Cup 2018 is increasing following Vietnam’s 3-0 win over Laos on November 8. 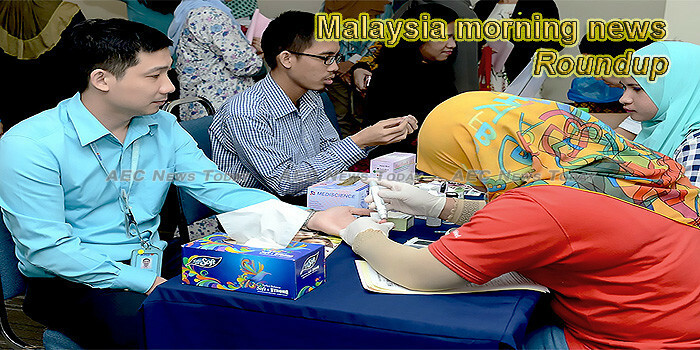 This week’s Malaysia morning news feature photo acknowledges World Diabetes Day, November 14.